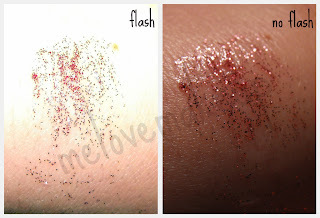 Sophsterlicious • UK Blog: Glitter Lashes From Barry M! I was sent this to try and thought it would be really nice for those sparkly Christmas looks. As you can see it comes in a twist up type tube with a brush on the end. It took me about twenty odd twists to get the glitter out mind! I think it's always the same with these things. Anyway, what do I think of it? .. I actually really like it, It has loads of really fine glitter packed into a clear gel base. What I really like is that the glitter is not chunky and irritating, I seriously couldn't feel it when I ran my finger of the swatch on my hand. It also can be used anywhere, not just on the lashes. I think it would be lovely on top of a pink eyeshadow look, or under the lashes. I couldn't get a good picture of it on my lashes so I just have swatches for you. These are £4.95 and available from the Barry M website, In a range of different colours.. Click Here.